Rain: The Camper’s Worst Enemy or a Blessing? Since my wife and I have become avid campers, I feel that I have acquired a mild obsession with Accuweather and the Weather Channel. I feel like I check the weather forecast two to three times a day, hoping and praying that the weekend will be filled with sunshine, good temperatures, and no rain. What camper wants rain during their camping experience, right? Especially if you are camping in a tent or pop-up camper! Amy and I have camped when it has rained. Fortunately, we have never been through a major thunderstorm. I know eventually we will have that experience and I am not looking forward to it. But it rain all that bad? I am a pessimistic person by nature but I want to take this opportunity to look at the glass half full, not half empty. A light rain in the evening while you are sleeping can be very peaceful. We woke up one morning to a small drizzle on the canvas of our pop-up which was rather relaxing. The birds were chirping and seem to be louder when it rains. Why is that birds chirp louder during the rain? Well, my wife has the answer in the “birding” section of this website…Click here. 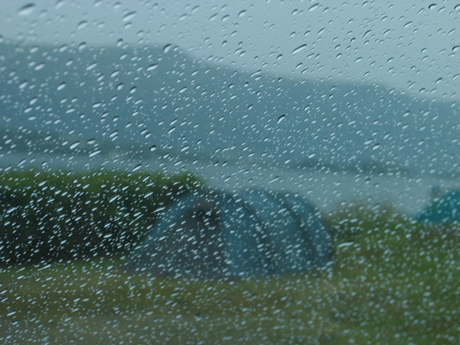 Rain can be viewed as an obstacle to campers’ plans but it also can facilitate plans. Families can hunker down in their campers and enjoy each others’ company by playing games, watching a movie together, or just talking with each other. In the age of cell phones, I-Pads, and other technology I think we have lost the art of social interaction. How many times have you been to a restaurant where you see mom and dad on their phones while the kids are playing video games or listening to their I-Pods? Several minutes could go by before any family member talks to one another. I am in no way bashing technology. However, our values have changed over the last few decades. Why is that families seem so much more connected 100 years ago? They did not have the distractions of the TV, computers, or other electronic devices that we have now. In essence, they were forced to interact with each other. Ok, I am off my soapbox now. So, I guess my point in that rant is that rain forces families to interact with each other. A simple game of Monopoly can bring out the best discussions and family time. Now, don’t get me wrong, I like camping and having a rain-free weekend, but I think there is something to be said for the positive effects of rain on a family’s camping experience. Ironically, in the middle of writing this blog, I checked Accuweather. See, I told you I was a little bit obsessed. The forecast is rain and thunderstorms all weekend 😦 Oh well, I guess I should look at it as the glass being half full, right? This entry was posted in Title. Bookmark the permalink.